My interview with bestselling children’s book author Dianna Hutts Aston picks up back at The Gaff, the local Cheers bar in Port Aransas, Texas, where everybody knows your name. Dianna and I are discussing her latest book, SOS: Messages of Hope, Love and Peace, which Dianna describes as a project “intended to bring people together through their shared hopes and dreams.” Part One of our conversation can be found here. Stacy: Dianna, we left off discussing the events that led you to want to write SOS. After your first “Save Our Souls” bottle full of messages was cast into the Gulf of Mexico, and later discovered on a deserted beach near the Mexico-Texas border, you were already organizing SOS in your mind. Dianna: That’s right. 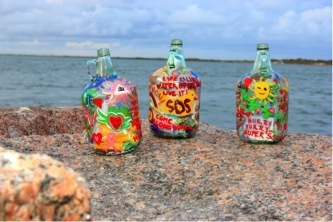 After that first glass bottle was found near South Padre Island, my friends and I were motivated to paint more jugs. Beyond the creative experience of painting the bottles together and soliciting new messages of hope, love and peace, our goal was that at least one more bottle would be discovered and that the messages tucked inside would be an inspiration to the finder. 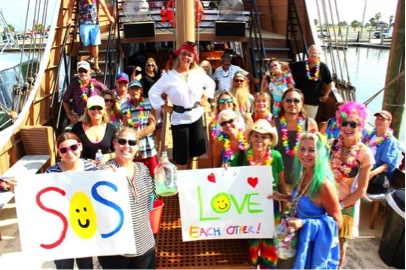 The endeavor was so positive and so much fun that on August 12th, 2014, I chartered the pirate boat, The Red Dragon, and invited friends and strangers of all ages to help me celebrate my 50th birthday. Among pirates Captain Silverbeard and Charlie Chinstrap, we painted bottles and posters and celebrated what had become an unlikely project, one that we endearingly call the ‘Bottle Project.’ It was from this boat that we cast Bottle 2 into the Gulf of Mexico. 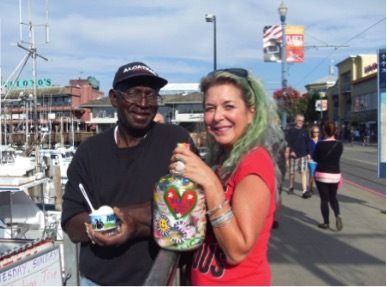 Shortly after my birthday, my friend, Dixie, and I decided to pack up and head for San Francisco via The Mother Road, Route 66, with the sole intent of meeting new friends and collecting new messages for the bottles. 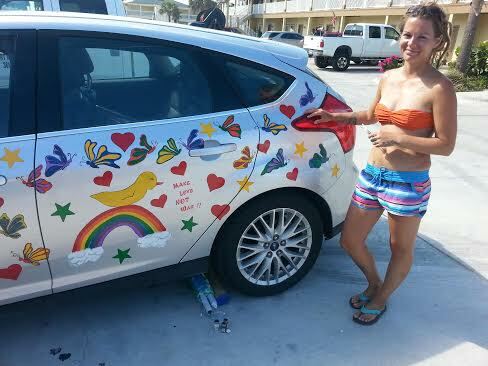 Victoria Ferguson, an artist/bartender at The Gaff, painted my boring silver Ford Focus in honor of the journey. She even painted its name on the front of the car: “The Maiden America II.” I go into a convenience store, come out and someone’s taking a picture. Happens all the time. Stacy: The many photos in SOS make your travels across America a very intimate experience for readers. Dianna: Yes, SOS is a beautiful photographic adventure, thanks to my dear friend, Donald Hatch, who captured all the notable moments here in Texas. I also have to thank Ann Wendle Aston (Dixie), my sister-in-law, who photographed the people and places we visited on our journey. Looking back on all the photos reminds me how important a story SOS is. And meeting so many wonderful people from all over the world who wanted to contribute their messages of hope and love makes me realize that borders are imaginary and that we all desire each other’s success–most of us, anyway. Along the way, we made friends at tourist stops and National Parks and everywhere in between, and each new friend from around the world added their personal messages to the mix. Stacy: Where did you cast the other bottles? 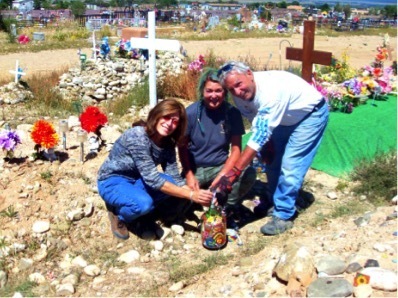 Dianna: In Taos, NM, some motorcycle friends and I put Bottle 3 on the grave of Dennis Hopper, Easy Rider. In the bottle are messages, along with a packet of ashes of my late boyfriend, Michael Snow Jones, a moto rider. Johnny, who discovered the first bottle, suggested Hopper’s grave after I told him about the ashes. The bottle is gone now. We don’t know who picked it up, but it’s fun to imagine where it must be now. In Havesu, AZ, we launched Bottle 4 into the Colorado River, which runs south into the Sea of Cortez. It was wrapped in ten feet of bubble wrap and two rolls of duct tape. Three hurricanes were converging in Cortez then, so it could be anywhere or even shattered. But in ten feet of bubble wrap? The Watts Towers are in my heart. Every time I’m in LA, I go to the towers. The favorite of my books, Dream Something Big/The Story of the Watts Towers, is about dreaming big, no matter what anyone says to discourage you. People told Simon Rodia, the builder, that he was crazy to build towers out of trash. He didn’t listen. He had a vision. The Watts Towers are now a National Landmark. People also said JFK was crazy for dreaming that we could go to the moon. We did. Dreams are in these bottles. Dream. Do it. In San Francisco, we wandered the pier looking for a captain to take Bottle 5 to sea. We were lucky to meet tuna captain Dave McKelvey, peacefully eating a cup of Ben and Jerry’s, when he was approached by a woman with multi-colored hair and a strange request: “Would you please take this bottle into the Pacific?” He thought a bit and said, “Ok.” A few weeks later, Dave called me to report the coordinates of the bottle’s launch and I remain hopeful that that it may reach Japan or another part of Asia. It was my editor at Chronicle Books, Victoria Rock, who suggested we go to the pier to find a caster. A few days later, and desperately wanting to be home, we stopped in Carson City, NV and met a friendly kayaker at Red’s 356 restaurant who hinted that he wanted to take a bottle far into Lake Tahoe. Dixie and I pondered over sweet potato fries. We gave him Bottle 6. We arrived back in Texas with Bottle 7, which was cast into the sea off the coast of Panama by a couple celebrating their 40th wedding anniversary. Stacy: You mentioned a total of nine bottles so far. What about Bottles 8 and 9? Dianna: We painted Bottle 8 at a writer’s conference. One of the students from Sarasota, Florida asked to cast the bottle into the Atlantic. Bottle 9 will be released off of the coast of Costa Rica by my dear friend and member of our original bottle crew, Mr. Darcy Trett, who is going to there to visit family. Stacy: Now that the book is completed, what’s next? Dianna: We remain hopeful that another bottle will be found and that the messages of hope and love and peace are a source of inspiration to whomever finds it. I think it would be magical to find a painted bottle with a hundred messages inside, the hopes and dreams of people worldwide, don’t you? Stacy: Would you share an excerpt from SOS to entice publishers to dive into Inkubate, where they can review it in its entirety? Dianna: Of course. As you know, my traveling cohort is my dear friend, Ann. We’d chosen aliases for the journey, however. She, as Dixie. Me, as Breeze. If you can sit side by side with a person in a car for 25 days, if you can sleep beside someone snoring for 25 days and NEVER have a cross word, then you know that you’re on the right track with a soulmate-sister. But after two weeks on the road, we began to feel a bit otherworldly. 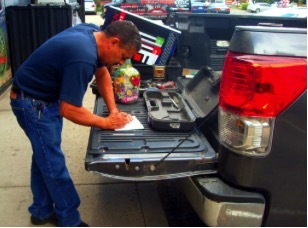 At a convenience store in Flagstaff, Arizona–while Dixie was buying weird stuff like Wasabi beans, organic bologna and vodka– I met Raymond, a handyman at a payphone, surrounded by tools, wires and unknown metal parts. Suddenly, the plight of payphones was fascinating. 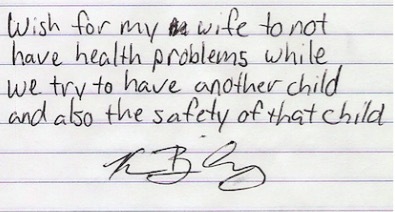 His wife had just called him, by cell phone, with good news from her doctor: She was clear of breast cancer. SOS is a book for all of us, all of us everywhere who dream. And everyone has dreams, even if they’re just hidden for a little awhile. This book is for the Finder. This book is for the Keeper. 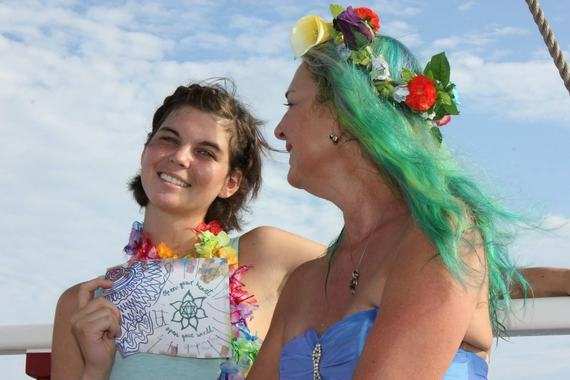 Stacy: Thank you Dianna for sharing this epic adventure with Huffington Post readers. Publishers interested in reviewing SOS: Messages of Love, Hope and Peace may sign on to Inkubate.com for free. Five of Dianna’s unpublished children’s books are also available on Inkubate. For more information on presentations, fees, scheduling, contact Dianna Hutts Aston here.